Talking about what inspired her to start Abooo and in particular stage work that would be of interest to parents, Cameron says “It struck me that pregnancy and new parenthood are rarely reflected on our stages. Equally, I realised that we rarely see topics such as miscarriage, stillbirth and postnatal depression and yet so many of these are shared experiences.” When she read The Replacement Child she knew that this play would be the top pick to mark her Company’s professional debut. Written by Vittoria Cafolla and directed by Martin Gibbons, Replacement Child tell the story of an English Lecturer Oscar played by former soap actor Rupert Hill and an artist Jude (Clare Cameron) a married couple who find themselves pregnant for the second time but all is not what it first seems. The staging by Sorcha Corcoran was a visual piece of excellence, which was versatile enough to create the adaptability of jumping between past and present during the scenes. The story starts when the 18 year old daughter of Oscar, Grace (played by Caroline Read), has been summoned to meet him after he had failed to acknowledge her milestone birthday of reaching adulthood. The two are shrouded in secrets and emotional pain from the past. Grace, now an adult, is tired of her father’s silence regarding her mother, Jude, and demands to know the circumstances leading up to her birth. Clearly traumatised by the absence of her mother, Grace is seen to be wearing her mother’s old stripy jumper - Oscar drinks his bottle of wine as he begins to enlighten Grace of her parentage and past. Grace learns that she had a sister, Stella, who fell asleep on her father’s chest and never woke up due to a sudden infant death syndrome, leading to the couple embarking on a journey of grief and turmoil. Oscar painfully relays witness of how they grieved differently as a couple, and how they were torn apart due to bereavement, ultimately leading to Grace’s conception on the night of the funeral. Oscar, feeling tricked and not ready for another child, eventually tears the couple apart - as bereavement and the loss of a child can so easily do. The months followed and Oscar becomes estranged from Jude until she goes into labour with their second child. Julia Haworth, former soap actress, plays Carol the midwife in a delivery suite which is under staffed and has no anaesthetist present (due to him being in theatre), leaving Jude limited options of Entonox and Pethidine for pain relief instead of the requested epidural. The dialogue is painful, but an intimate insight into the reaction and what follows after a death of a child - from the blood curdling scream of a mother, the police involvement, organising a funeral, choosing a small white coffin to carry the precious baby, registering the death and how the parents' world collapses never to be the same again. The play is just over 70 minutes long with the opening night giving the audience an opportunity to meet the team for a ‘Question and Answer’ session with Martin Gibbons, writer Vittoria Caffola and the design team and cast after the show. 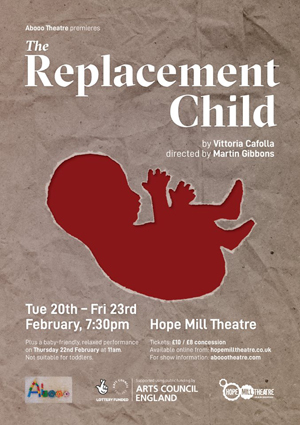 All performances of The Replacement Child are supported by Child Bereavement UK, offering information & support. This play is a powerful emotional insight to child bereavement and the devastation that follows for a couple and the child that becomes the replacement child.